Greenville may be the place to be, but we’re surrounded by some fantastic towns that offer unique experiences all their own. A trip through these towns will give you the opportunity to mingle with the locals and enjoy authentic Southern hospitality. Taylors is Greenville’s largest suburb—and it isn’t even an incorporated town. Exploring here gives you the feeling of having discovered something before anyone else. Today Taylors is chiefly a residential community, but the area was once a resort area and is still home to many parks and trails. Taylors is having a rebirth as artists, craftsmen, breweries and others have discovered this community and brought new life, particularly to the newly revamped Taylors Mill. Since the first train slid into the new depot in 1886, the city of Mauldin has been a destination for travelers. Mauldin loves a great festival and will hold one for flowers blooming, trains, BBQ, Christmas, beach music — any excuse that brings out friends, visitors, good food and good music. Summer markets and concerts along with year-round sports, city parks and the nearby Lake Conestee Nature Park make Mauldin a laid-back and relaxing destination. How can you resist a town with hospitality in its name? The city was once a stopover for weary travelers and drovers. Today it is more likely to be a refreshing destination for weary cyclists and runners as a reward for conquering the GHS Swamp Rabbit Trail, knowledgeable outdoorsmen headed to Sunrift Adventures or cooks seeking fresh-from-the-farm vegetables at the TR Farmer’s Market. Along with music in the park, wide inviting trails, local pubs and cafes, there is the feeling that you are sharing this with your best friends. No hurry. No hassle. It’s still a great place for a traveler to rest. Long a very popular place for family living, Greer is quickly becoming its own destination for top-quality dining, fun and funky festivals, shopping, art and even a few street dances. 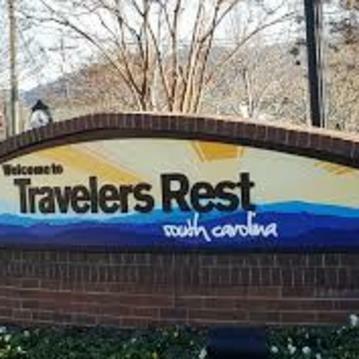 Experiencing Greer might take you from the outskirts of GSP International Airport to a quiet walk through the charming downtown to a local golf course or a peaceful day on one of the city’s two lakes. Sure Paul Simon rocked Central Park in New York City, but he’s also played Simpsonville! The folks of Simpsonville like to bring in great entertainment to Heritage Park Amphitheatre and then declare it a party. And it is! Along with the top-name entertainers who fill that stage all summer long, Simpsonville offers family movie nights, festivals, great Southern dining (and an Ice Cream Station! ), historic buildings and a warm welcome to guests. If you rode along the old stagecoach route in the 1800s, you might stop at the inn that had a fountain nearby. Get it? Fountain Inn it was called by the drivers, and Fountain Inn it still is. 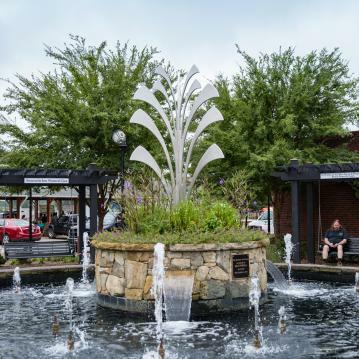 Even today, a bubbling fountain marks the quaint downtown of this Greenville suburb. The city hosts regular bluegrass and other outdoor concerts, along with a farmer’s market, an active performing arts schedule, the annual Aunt Het festival and a nostalgic Christmas festival.